Smart and secure medical devices and systems just moved to the fast track with the announcement of the launch of PracticePoint at WPI, a pioneering healthcare initiative that brings research, development, and testing of these revolutionary devices under one roof. In her opening ceremony remarks to gathered elected officials, WPI board members, faculty, industry partners, and community members, President Laurie Leshin touched on the changes PracticePoint will inspire—from new technology to workforce growth and continued leadership in the digital technology industry. The launch announced several grants and industry partnerships that will support all facets of this collaborative healthcare initiative that will be located at Gateway Park. Lt. Gov. 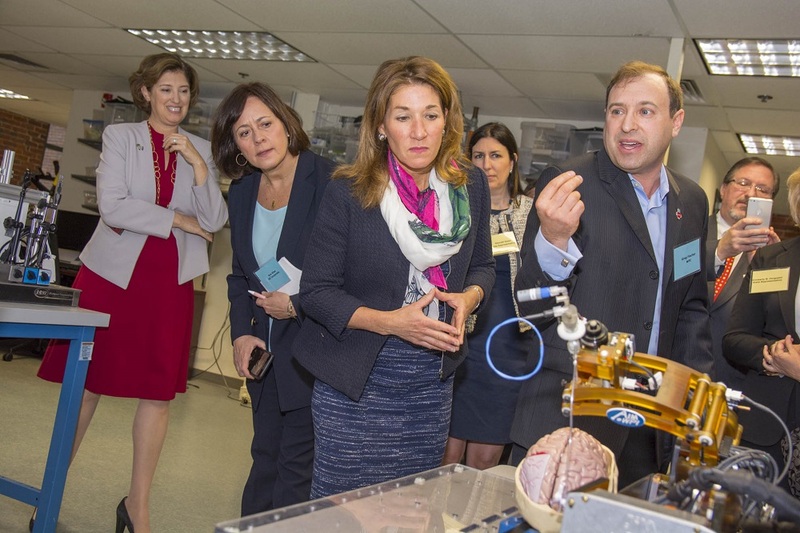 Karyn Polito announced a $5 million capital grant from the Massachusetts Technology Collaborative (MassTech) to help build the new facility. These public funds have been matched by a GE Life Sciences $2.5 million capital and imaging equipment grant, and by WPI’s $9.5 million commitment for facility, faculty, and staff support, and operational support. Long-time WPI partners UMass Medical School and MITRE both pledged faculty or staff time and research support. PracticePoint at WPI brings the resources needed to develop a smart medical device from prototype to product into one facility. Allowing teams to work so closely and on readily available equipment effectively eliminates the typical long wait times between the research, development, and testing steps necessary to create smart medical devices and systems. PracticePoint at WPI, a membership-based alliance, allows collaboration with academia, industry, and healthcare providers to develop cyber-physical systems and smart medical devices without the typical barriers to accessing the time, space, equipment, and expertise. “We will take the technology and innovation we develop here and scale it across the world to solve some of the toughest challenges we face,” said Leshin. Before introducing Polito, Tim Connelly, executive director and CEO of MassTech, remarked on the strength of the collaborations between citizens, cities and towns, industry, academia, and the Baker-Polito administration. These partnerships all play a critical role in developing the strong innovation ecosystem of Massachusetts and in providing the training to keep it strong. “To stay on top, we have to continue to foster the growth and development of the talented STEM workforce we have in Massachusetts,” Connelly said. With WPI’s academic and research strengths in robotics, sensors, data science, cybersecurity, and systems engineering; the authentic healthcare clinical expertise of UMass Medical School; and the equipment, knowledge, and support of both GE and MITRE, PracticePoint’s comprehensive collaboration allows for gains in each stage of product development. “Developing medical devices is challenging,” says Greg Fischer, an associate professor of mechanical, biomedical, and robotics engineering and director of the initiative, grant and PracticePoint at WPI. “This is particularly difficult when you start working with smart medical devices.” Generally the test-bench development stage moves into the research lab and then onto the clinical environment, he says. But researchers often must work around patient scheduling to access needed equipment and facilities (and to repeat the process as refinements are needed). The wait times often add significant delays. In addition to Fischer, David Cyganski, professor of electrical and computer engineering, was instrumental in the development of PracticePoint and will be closely involved in building the research agenda going forward. Numerous faculty will lead research and other projects in the facility, including Berk Sunar, Thomas Eisenbarth, Krishna Venkatasumbramanian, and Elke Rundensteiner. The group checks out a machine in the lab. In addition to having on-target expertise, WPI is located in a state with more than 350 health technology-related companies—a so-called Digital Health Cluster. PracticePoint at WPI will be a boon to that economic segment, but patients will reap the biggest gain—potentially life-saving, and surely life-changing, developments. The facility design will replicate conditions where patient-centered care is provided. Four testing suites will include a surgical/imaging area; a controlled-care setting, such as an emergency room or intensive care unit; a rehabilitation/assistive care center; and a residential setting that will mirror a private home or a nursing home. The facility will have access to equipment to test for cyber vulnerabilities and will also be able to access big data collections for relevant populations. Smart medical devices are just one aspect of digital health innovation that make it easier for people to live independently. For instance, smart and secure medical devices and assistive systems can monitor and send relevant alerts on information like vital signs, diet, hydration, or an unsteady gait of a senior citizen who is home alone. These devices can help someone recovering from surgery monitor warning signs or signs of improvement. Some devices can even remove potential tripping hazards or help someone adhere to a strict medication schedule. In a surgical environment, smart medical devices open a new world of possibility and hope, thanks to the technological improvements that allow robotic-assisted surgeries or assistive devices. For instance, robotic systems, which can be smaller and more precise than a human hand, can allow access to areas of the body that were previously too risky for surgeons to manage. And during the surgery, the surgeon can be guided by real-time images using cutting-edge technology. Having all the teams and equipment in a central location saves time, money, and effort, but it also creates an intangible environment where innovative thinking and creativity are allowed to flourish. PracticePoint’s launch concluded with a tour of the WPI Robotics Engineering Lab, where attendees chatted with students and learned about the current healthcare-focused projects they are working on. Build-out of the PracticePoint facility is expected to begin next year.